So you want to get into sleeping elevated, do you? From experience, it takes some time and requires a degree of trial and error to dial in your hammock camping gear list and perfect your setup. 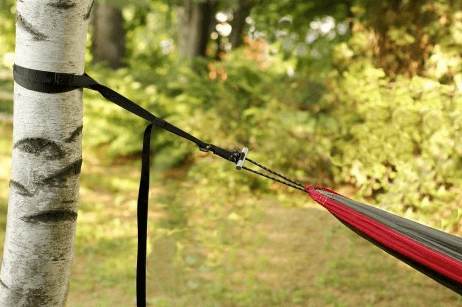 Getting a good hang (as die-hard hammockers call it) takes some experimenting and can require different considerations depending on the trees you’re hanging from. Other environmental factors will affect the quality of your hang as well. Wind exposure can make you colder and the angle that the sun hits your hammock in the morning can cause you to wake up earlier than you intended. 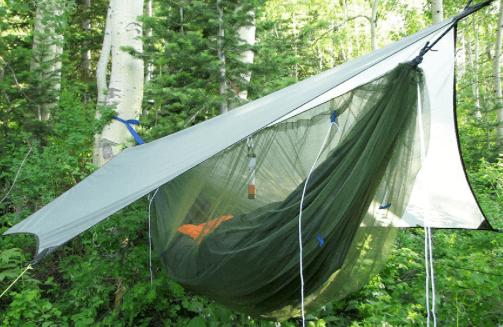 These are just a couple examples of the considerations you should account for when hanging your hammock, but before you can even get there, you need to make sure you pack all the supplies you need to be a successful hammock camper. 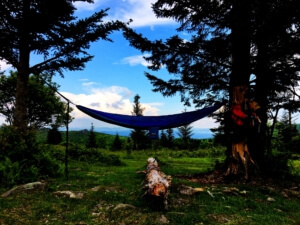 In this post, I’ll share my must-have items for hammock camping. 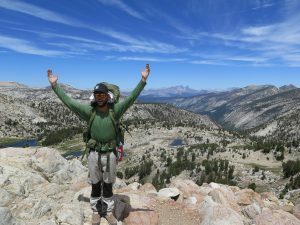 Side note: Once you’ve learned about all the gear you need to complete your hammock camping setup, be sure to investigate the articles in my Hiking Tips and Trails section. 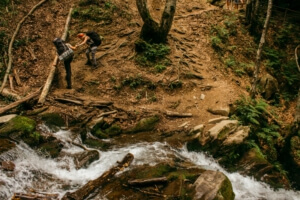 Check out my Outdoor Gear page for reviews on water filters, tents, hiking shoes, trekking poles, and more. 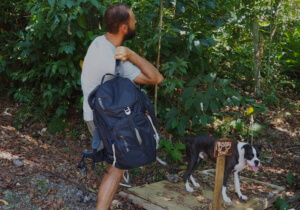 Also, you might enjoy my Backpack Reviews if you’re in need of a new pack, which include brands like Kelty, REI, and Gregory. Finally, my YouTube Channel is full of informative video content if you’re not really into reading! This is an obvious place to start. When searching for a hammock, you should look for a model that has the capability to support your body weight plus about 100 pounds. This gives you the extra capacity for a book, water bottle, all your other sleeping supplies, and even your trusted furry companion if you so desire. The good news is that you don’t have to overspend to get a quality hammock that’ll get you started. The catch is that the cheaper models usually come by themselves, which means you have to purchase straps separately. For my money, it’s always more economical to purchase a package that includes (at the very least) a hammock and the straps to hang it from. If you already have a hammock, but still need straps, I highly recommend you look into Kammok’s Python Straps. They are durable, lightweight, and give you 18 different attachment points so you have plenty of flexibility in how you hang your hammock. Each strap is ten feet long and their wide design makes them friendly to the trees that so graciously support your hammock. They also have reflective tracers sewn in so that you don’t clothesline yourself coming back from your midnight bathroom run. As a general rule, hammock camping tends to be a little cooler than sleeping in a tent. 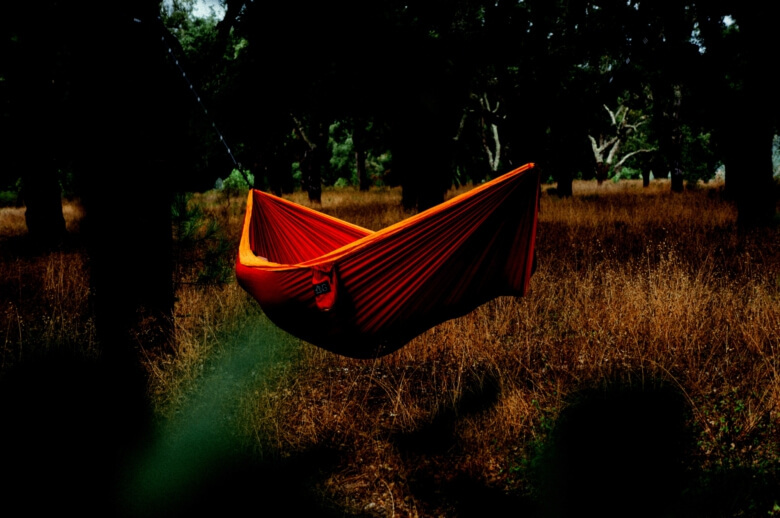 The additional airflow around and underneath your hammock can cause you to get cold in the middle of the night. Because of this, I recommend using a sleeping bag that is rated for temperatures about 10 degrees colder than the sleeping bag you typically use for tent camping. If you don’t have a sleeping bag for tent camping, I’d recommend getting a bag that’s rated down to at least 20 degrees Fahrenheit for hammock camping. 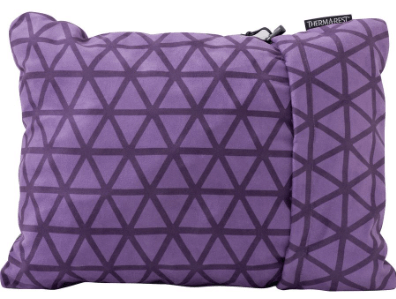 My personal go-to hammocking sleeping bag is actually the backcountry bed by Sierra Designs. The wide design of this bed basically eliminates the shoulder pinching that can happen in a hammock with narrower sleeping bags. I also love it because it allows you to stick your feet out at the bottom, which can serve to cool your body down as you wind down for the day. It also makes it easy to pull them back in once you really your toes have gotten a bit chilly. The other item that should always go with your sleeping bag when hammock camping is a lightweight sleeping pad. When I first started hammock camping, I thought I didn’t need a sleeping pad because there wasn’t any hard surface that I wanted to pad my back against like I would normally have in a tent. Boy, was I wrong! The primary reason for adding a lightweight sleeping pad (such as the Therm-a-rest Z-Lite) to your hammock camping gear list is for insulation. By putting your pad in your hammock and underneath your sleeping pad, you add a critical layer of insulation between your back and the cool air underneath your hammock. You’ll feel the difference when you wake up in the morning and realize you didn’t have to struggle through that 3 am to 6 am window when the night is coldest. I actually place my sleeping bag inside my backcountry bed because it’s big enough and I can do it. An added benefit of this approach is that my Z-Lite sleeping pad includes a thermal layer that reflects my body heat rather than allowing it to escape to the outer air. This makes me warmer throughout the night and, in the heart of the summer, able to sleep nearly naked in my hammock camping setup. A couple more items that you need to add to your hammock camping gear list are a bug net and rainfly. 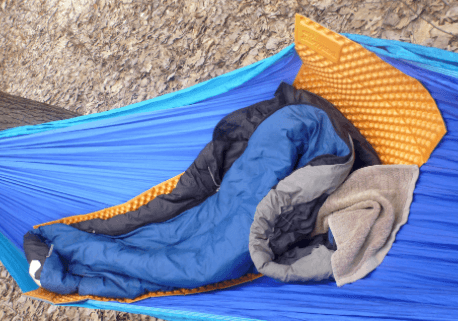 Depending on the time of year you’re going hammock camping, as well as the immediate forecast, you might not ALWAYS need these items, but they are a critical part of any thorough hammock camping gear list nonetheless. The bug net that you choose should integrate seamlessly with your hammock and allow zero opportunities for mosquitoes, flies, and other pests to infiltrate the sanctuary of your hammock. If you choose a bug net that is not compatible with your hammock, you risk having small openings or seams where those pesky pests can get in and then spend the entire night bothering you. Because my hammock came from Kammok, I purchased the accompanying bug net to go with it. On one of my first hammock camping trips (a river kayaking trip on the Angelina and Neches River down near Martin Dies Jr. State Park in Texas), the bug net was indispensable. We camped in very thick brush (and in alligator country) in the spring, which meant loads of pesky pests and solid motivation to sleep up off the ground. As far a rainfly, this item may be even more important than a bug net. For those of you that have done some camping in the past, you probably know how quickly the weather can change overnight. For those that haven’t, I’ll just tell you it’s never fun to wake up in the early hours of the morning to realize it’s raining and you neglected to put your rainfly up when you went to bed. Nobody really likes scrambling to put their rainfly on when they can hardly see and water is falling out of the sky more abundantly by the second. Unfortunately, the hammock I initially bought didn’t come with a rainfly or tarp, so I had to search for a suitable companion. What I found was the XL Hammock Tarp from Madera Outdoors. This tarp integrated seamlessly with my hammock and made me feel so much more confident in fully committing to hammock camping. On my trip to the Ruby Mountains last summer, we did a less-than-stellar job planning for rain, but my hammock rainfly came through in the clutch to keep us warm and dry. To be honest, I went without a compressible pillow for hammock camping for years. I always THOUGHT I was comfortable until I got to try out a buddy’s compressible pillow. Just that slight adjustment of having your head elevated a little further above your shoulders was exactly what I needed to really settle into my hammock and achieve an excellent night’s sleep. Another benefit of a compressible pillow comes when you turn on your side. Believe it or not, many backpacking hammocks are wide enough to allow you to curl up and get comfortable on your side if you’re a side-sleeper (like me!). As you might imagine though, sleeping on your side without a pillow to support your head can cause an uncomfortable bend in your neck. When you sleep like this for many hours throughout the night, your neck usually doesn’t feel too great when you wake up and roll out of your hammock (not literally!) in the morning. After my initial experience with a compressible pillow, I still tried to avoid buying one of my own. I found an old, soft-foam Raiders-branded football around my house that I started packing as my hammock camping pillow. That satisfied the initial need, but it wasn’t nearly as comfortable as a proper compressible pillow. If you’re looking for one of your own, I highly recommend this one from Therm-a-rest! As I mentioned above, the only major problem that many people have with hammock camping is that they get colder than when sleeping in a tent. 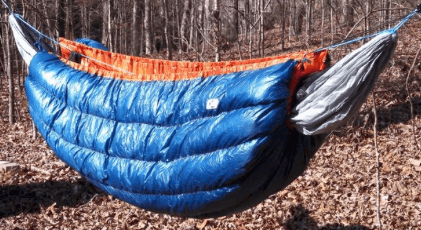 While getting a sleeping bag rated for colder temperatures is often enough to do the trick, an underquilt is really necessary if you want to make your hammock camping setup usable for all four seasons. An underquilt wraps around the bottom of your hammock and provides yet another layer of insulation (in addition to your sleeping bag, pad, and the hammock material itself) from the cold air that settles underneath your hammock overnight. Many of the best underquilts are made with down or synthetic insulation and are rated for a certain temperature range, just like sleeping bags. As with a bug net, you should always make sure that the underquilt you’re thinking of purchasing is compatible with your existing hammock (or the hammock you’re interested in buying). Without proper compatibility, the underquilt won’t effectively snug up to the exterior of your hammock and, as a result, it will leave a critical layer of air between that causes you to get colder at night. If you’re looking for a hammock underquilt, these options from REI and ENO are a good place to start! So there you have it! I hope you’ve enjoyed this summary of what should be included in your Hammock Camping Gear List. I’d love to hear your feedback in the comments section below. I’ll be quick to reply to any questions, comments, or concerns you feel like sharing. If you are inspired to buy your own hammock and use it for your next camping trip, check out my recent review of My Top Backpacking Hammocks.